1)Open the cup by pulling the lid halfway and add seasonings from sachet. 2)Pour 280 ml of boiling water (to the place indicated on the package). 3)Cover and brew for 3 minutes. 4)Carefully stir the soup and Enjoy! 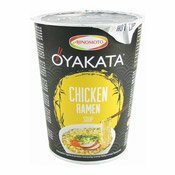 Simply enter your details below and we will send you an e-mail when “Oyakata Instant Cup Noodles (Chicken Ramen) (親方雞拉麵)” is back in stock!